I was going to write this review Thursday night. That was before some psycho threatened to blow up my office building, prompting me and my co-workers to evacuate. I left all of my stuff on my desk and it took the full five hours of police negotiations before I was let back in to retrieve it. By the time I got home, it was 11 PM. Where is Daredevil when you need him? 😉 (And before you ask, I’m totally fine, and the ordeal wasn’t really as scary as it sounds.) So, with a busy Midsummer weekend on top of that, it’s taken me until now to get this review down. Go easy on me! Daredevil #4 is yet another wonderful issue by Mark Waid, Chris Samnee, Javier Rodríguez and the rest of the team. The particular strengths of this issue rest on the interesting interplay, both physical and psychological, between Daredevil and the Shroud, as well as the strong Daredevil character moments we’re treated to as a result. I will start with two points of criticism however (and this is a good thing, when you think about it, because this title is generally running the risk of being so consistently good that it’s a real challenge to review it without simply gushing). While beautifully illustrated, there’s something about the opening scene, continued from the cliffhanger which marked the end of last issue, that doesn’t quite work for me. Even though superhero physics are more permissive than anything you’d find in the real world, I’m having a hard time wrapping my head around the entire sequence of events, and just how Matt is able to keep his rear end out of the flames. There’s just a little too much that goes into what amounts to a split second. Not a huge deal, but a bit of a nuisance. The second thing is the go-stop-go pacing of Matt’s fight at the Owl’s mansion, his subsequent dinner with Kirsten and the immediate launch back into the heat of things as he changes into his Daredevil costume and goes after the Owl and Shroud in a new location. I see the point in having Matt check in with Kirsten – as she supplies much-needed information and a fresh perspective on the Shroud’s actions – but the opening scene feels a little rushed as a consequence, and the idea that Matt would go straight from that showdown to a restaurant is a bit jarring. The restaurant scene is quite charming, however, and also serves the purpose of reminding the reader of Matt’s new status quo as an out – and apparently quite famous – superhero. 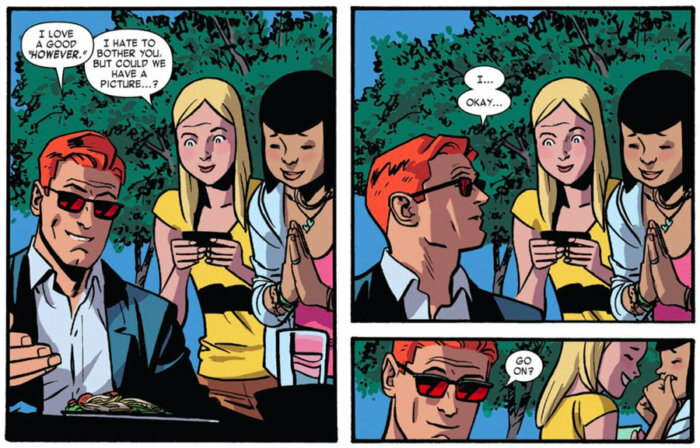 These issues aside, and pacing issues have been exceedingly rare during Waid’s tenure as Daredevil writer, the rest of the Daredevil #4 is a very smooth ride, and a great-looking one at that. Samnee skillfully handles the particular strengths of Daredevil’s and the Shroud’s respective power sets. In fact, the dynamics of their relationships is the star of the issue, with the Owl’s presence fading into the background, despite his suitably menacing appearance and spectacular transformation. That isn’t to say that the Owl isn’t well-handled, it’s more of a testament to how interesting the two “heroes” are, going head to head. I never would have expected that this particular pairing would work as well as it does, but it’s apparent that writer and artist(s) alike are having a fun time pitting these two against each other. It is clear that the Shroud triggers something in Matt, and it’s easy to see why. In Max Coleridge, Matt sees someone who in some respects is uncannily like himself – a lawyer, traumatically blinded, and tormented by lost love – who has gone down a road that Matt himself has narrowly escaped. Perhaps it is the knowledge that he could have easily let himself retreat into insanity that causes Matt to be as hard on Max as he is in this issue. Matt’s judgmental side rears its head, and I think it’s an interesting, yet familiar, take on the character. As for the art, Samnee continues his run of excellence. I’ve never been a huge fan of pure fight scenes, I view them more as a necessary evil of superhero comics than as the raison d’être of the genre, but Samnee makes them truly interesting. 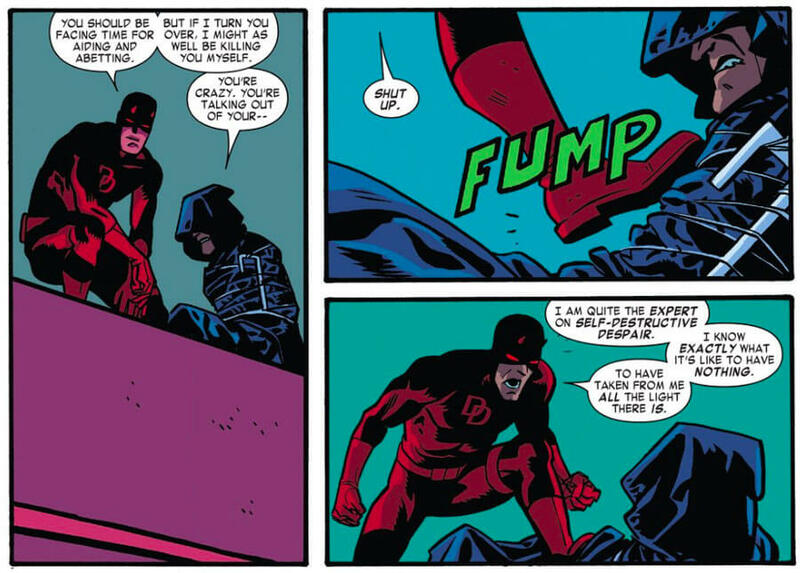 An artist can get away with drawing a disjointed series of plausible poses and postures, but the art in Daredevil let’s you really see the action unfolding, with a true sense of what’s happening between the panels. You also get a sense that the way these scenes are choreographed, there is a careful consideration of how these particular characters would logically interact. There is nothing generic about these scenes, and they too are infused with the personalities of the key players. Javier Rodríguez’s colors are, as always, a great complement to Chris Samnee’s line art, and in the encounters between Daredevil and the Shroud, there’s a great contrast between the vibrant bright red of our horn-headed hero and his dark and dramatic adversary. The move to the West Coast is also evident in the color scheme that gives a slightly warmer, more exotic touch to the backgrounds and general scenery. I’ll have reason to return to Matt’s new public status, highlighted in the restaurant scene at the beginning of the issue, in a separate post. So, if you felt that I just skimmed that part, stay tuned! With that said, I think I’m ready to round this off. What did you guys think of this issue? Let the rest of us know in the comment section! I felt much the same as you did, about the intro. It felt a bit rushed and the subsequent scene at the restaurant was jarring even if it was beautifully drawn and colored. Having voiced those slight criticisms however, it is still my favorite book month to month. “Suicide by super villain” is an ingenious concept and one DD is uniquely suited to recognize. Kudos. This version of the Shroud is the most interesting new character in the book in awhile. I’d love to see him become a regular cast member. When the character Max was first shown I was put off by the fact that he seemed to me somewhat deranged. This issue made me understand the character because of what Matt revealed about him. I remember that Julia Carpenter and Max fell in love from the waste-of-my-money Civil War event. I did not know that Max’ feelings for Julia were this deep. Max should take up Matt’s offer of helping him find Julia. Solid review! I enjoyed the issue very much. Samnee has been knocking the art out the park in every panel this new volume. Javier’s colors are a huge compliment to his line work. It will be interesting to see what the new colorist brings to DD’s pallet. Waid’s run continues on solid ground! Plus I received my new DD hat in the mail so…well there’s that. 50 years without fear!